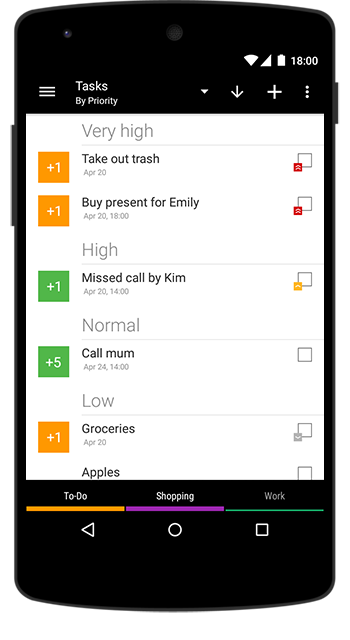 Imagine this situation: you create a grocery list. Where do you enter your shopping items? In the task description? Or you create a task for every single one? None of the above. 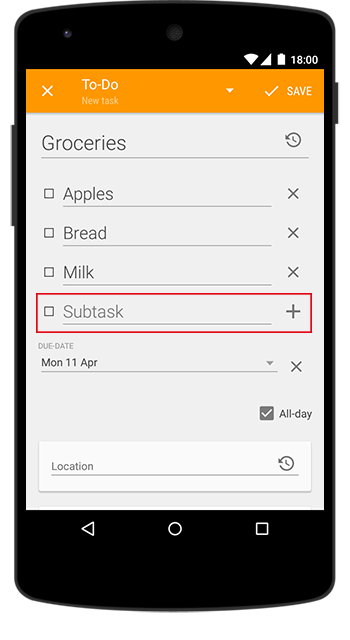 You use the subtasks. This way you can mark the items in your calendar while putting them to the basket. And this is just one example for the subtask usage. You can enter the subtask directly in the event creation/edition view or in the event detail view. In the latter case, please remember to click on the ‘+’ icon in order to save the subtasks. 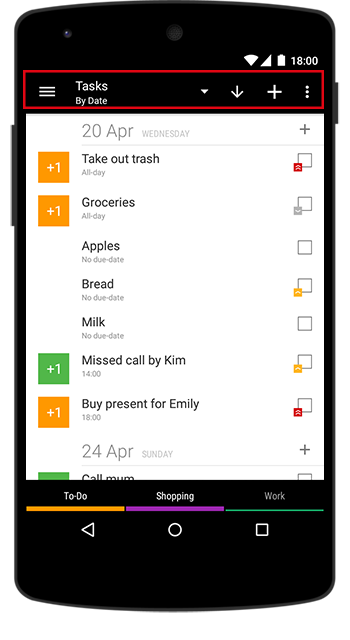 You can complete your tasks likewise any other parent task, from every calendar view and widget they are visible in. 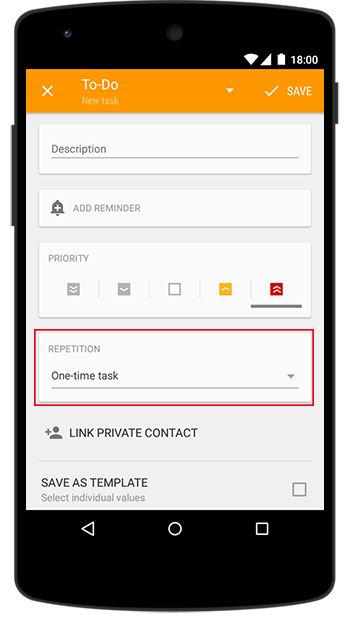 Please note, that the parent task will be automatically marked as done, when all subtasks are completed. Do you find one of your tasks more or less important as the others? You easily distinguish it from the other by setting a priority to that task. The 5 priorities in BC 2 range from very low to very high. 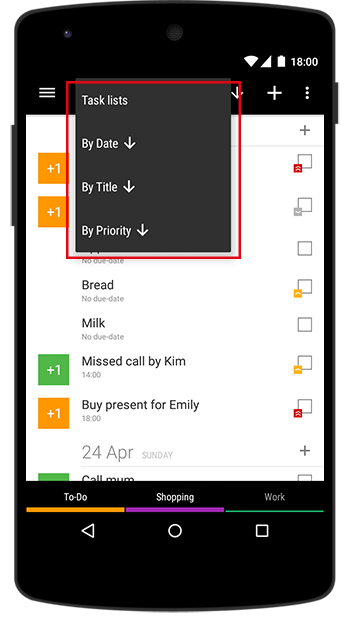 Moreover, in the task view your can sort your task by priority. 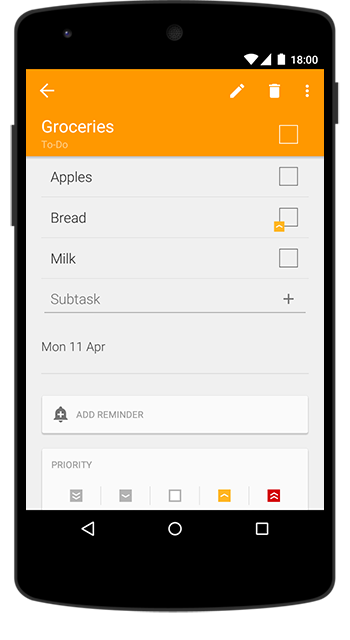 You can either set it as the default sort order for the view ( → Settings → Views → Tasks → Default start mode → Priority descending/ascending) or click on the menu drawer in the task view to change it directly there. Do you have tasks that repeat in the regular intervals? This function will allow you to easily create the whole task series at once. You will not have to copy your tasks or create them every time from the beginning anymore. Hint 1: Please remember that the task series function differently to calendar series. All the repetition instances of the task series will NOT appear directly in your calendar. The following repetition for the series will only then be generated when the previous one is marked as done. Hint 2: Please note, that the series and priorities are not recognized by Google and therefore will not be synced over from one to the other device. You can, however, manually back the categories up with the import/export task lists feature. You will find it in the settings under maintenance.